Large Granular Lymphocytic Leukemia (LGLL) is a rare cancer of one type of white blood cells, with less than 1000 new cases reported in the United States each year. These white blood cells, known as lymphocytes, are fundamental for the body’s immune response. 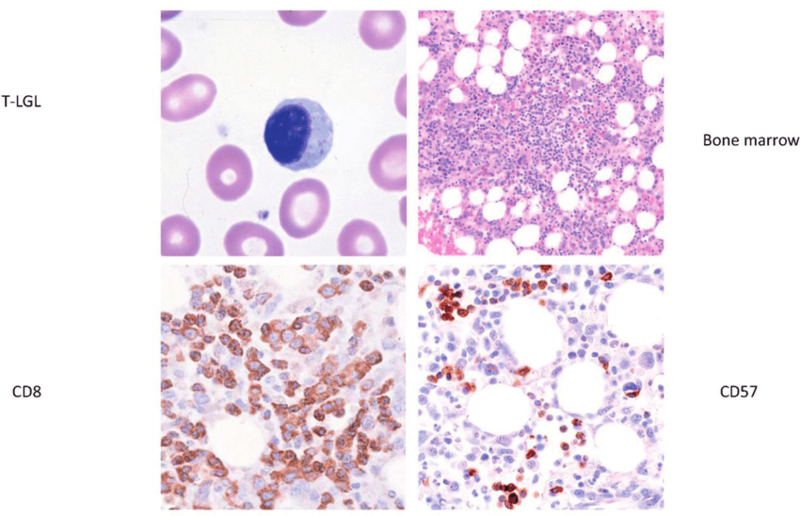 LGLL is characterized by excessive lymphocyte proliferation (cell growth), leading to a higher than normal percentage of these cells in the blood. The altered proportions of blood cells result in symptoms such as repeated infections and anemia. What are the different types of LGLL? There are two different variants of the disease: T-LGLL affecting the T-cell lymphocytes, and NK-LGLL affecting the Natural Killer lymphocytes. Disease progression in T-LGLL is chronic; however, in NK-LGLL the disease may progress in a chronic or aggressive manner. Chronic T-LGLL is the most common form, representing around 85% of cases, whereas the less common aggressive NK-LGLL affects fewer than 10% of cases. T-LGLL and NK-LGLL account for 2% and 5% of lymphoproliferative disorders. Men and women are equally affected, and the average age of diagnosis is 60 years. Fewer than 25% of individuals are diagnosed below the age of 50. Risk factors for the disease include autoimmune disorders such as rheumatoid arthritis; these are reported in 20% of cases before the leukemia presents. Blood smears are routine for diagnosing LGLL; the blood is observed under a microscope to examine the lymphocyte count and observe whether there is an expanded T-cell or NK-cell population. LGLL is characterized by enlarged lymphocytes with numerous granules. A bone marrow biopsy may also be performed to confirm the diagnosis. Although there is no cure for LGLL, the disease responds well to treatment. Due to the slow progression of chronic LGLL, intensive treatment is not required as for other types of cancer. The proliferation of cells is very slow; therefore a ‘wait and watch’ approach is adopted until treatment is deemed necessary. Many patients will live for years before needing treatment; however, the majority will inevitably require it as the disease evolves and symptoms worsen. Signs that treatment should commence include severe neutropenia leading to repeated infections, and anemia severe enough to require transfusions or to produce symptoms, as well as the presence of autoimmune conditions which need to be treated. Aggressive T-cell and NK-LGLL, however, does not respond well to treatment. Treatment is often similar to that of acute lymphoblastic Leukemia, but average survival time is usually less than two months.